Wine is relatively young at 36-years-old, which makes for a sharp contrast with President Museveni at 74, who has ruled the country for 32 years. The demographic divide also represents a wider trend in Uganda, with prospective youth workers tiring of the NRM missive of stability and security, while crime increases and corruption scandals pile up. The rise of the “People Power” movement also poses questions for the future of the established opposition, which continues to be split over whether to support Bobi Wine while also eroding its own support base among the youth. The government will likely hesitate to penalize Bobi Wine too harshly given his international support, though it nonetheless faces the long-term threat of its growing youth demographic and will have increasing difficulties halting popular opposition and demonstrations. Travel to Kampala may continue while adhering to general security protocols with regards to the threat from criminal elements. On August 14, popular musician and Member of Parliament Robert Kyagulanyi, aka Bobi Wine, alongside 12 other opposition members were arrested after allegedly attacking President Yoweri Museveni’s convoy in Arua, Northern Region during local by-elections. Bobi Wine was in Arua to support candidate Kasiano Wadri, who later won the by-election, and both were charged with treason in a military court the following day. Subsequently, #FreeBobiWine protests broke out in Kampala and were forcibly dispersed by security forces using live fire and tear gas. Eventually, over 100 people were arrested for participating in the demonstrations. Bobi Wine was released by the military court in Gulu on August 23, but was immediately re-arrested and charged with the same offense in a civilian court. He and 12 others were reportedly released on conditional bail by the Gulu civilian court on August 27. Following his release, Wine departed for the US for treatment for injuries that he suffered while in detention. He returned to Uganda on September 20, where he was briefly arrested again but released to his hometown soon after. 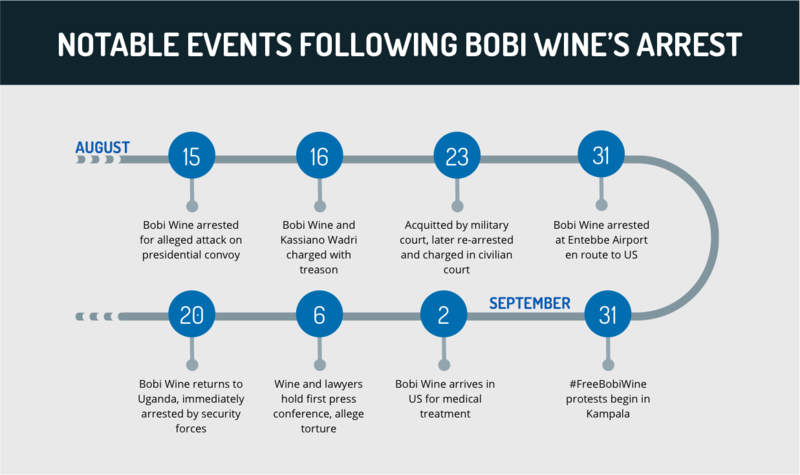 The arrest and subsequent trial of Bobi Wine shines a light on the Ugandan government’s low tolerance for dissent and tendency to conflate political opposition and challenges to the status quo with threats to state security. This trend is not new, as figures opposed to President Yoweri Museveni have long been prosecuted by the government on highly questionable charges. Furthermore, while the treason charges against Wine appear to be of a serious nature, they remain relatively regular occurrences in Ugandan politics. Kizza Besigye, former Museveni confidante and now a leader of the main opposition Forum for Democratic Change (FDC) party, was also accused of treason twice in 2006 and 2015, though he never actually faced any punishment for the charges. However, the Bobi Wine crisis represents a unique set of circumstances that remains removed from other opposition movements. Firstly, Wine is relatively young at 36-years-old, making for a sharp contrast with Museveni, now 74 after ruling Uganda for 32 years. The demographic divide also represents a wider trend, with the country having the world’s youngest population, with over 78 percent of its population below the age of 30. Furthermore, Bobi Wine’s status as a pop culture icon and artist has allowed for the reality of President Museveni’s repressive politics to be broadcast to a more international audience than traditional observers. This is best exemplified in the open letter published on August 22 calling for Wine’s release that was signed by more than more than 80 artists, activists, nobel laureates, and politicians condemning his arrest. This may pressure the government to refrain from imposing penalties on him to avoid international ramifications, and it has also enthused Bobi Wine supporters, who perceive him as something exciting and new. After three decades of President Museveni’s rule, and nearly two decades of the only challenger to the presidency being perennial election runner-up Kizza Besigye, Wine represents the new face of opposition towards the government. Wine’s message of “People Power” seems to resonate with a populace that has only ever known President Museveni as the center of power, whose legitimacy is pinned to the Liberation War of the 1980s, which is somewhat distant and remote by the growing generation born after the war. This is especially significant, as this youth population faces current crises over rising crime rates, government corruption, and mass youth unemployment. More concerning to the ruling National Resistance Movement (NRM) and opposition FDC is Bobi Wine’s political resilience since his own victory in the Kampala by-elections in April 2017. Many watchers at the time had brushed aside Wine’s victory as a byproduct of Kampala’s reputation of being an opposition stronghold and suggested that his political influence, if any, would likely struggle to break out of Uganda’s Luganda-speaking regions, thereby limiting his national appeal. However, this prediction has been proven wrong on multiple occasions. Since Wine’s own victory in 2017, candidates supported by Wine, most of them relative outsiders and independent politicians, have gone on to crucial victories in Jinji, Burguri, and most recently Arua. While the NRM still holds a healthy majority in Parliament, the political developments cannot be ignored lightly. Wine has used the various by-poll wins to launch the ‘People Power’ movement into the national consciousness. Furthermore, the support for Bobi Wine presents a greater threat to the traditional opposition FDC, as fractures have emerged in the party over whether to throw its support behind Bobi Wine for his opposition to Museveni, though it undercuts public support for FDC-vetted candidates. The outspoken support for Wine by Kizza Besigye has also eroded the decision-making process in the party. Furthermore, while the government cracks down on opposition supporters, the language it employs to describe its actions is perceived by Ugandan youth as condescending. This perception is seen when President Museveni, who is still held up by NRM cadre and ruling politicians as the father of modern Uganda, dismissed the protestors as unruly and having lost their way. In social media posts, President Museveni referred to the demonstrators as Uganda’s “grandchildren” and Bobi Wine as “our ill disciplined grandson”. This allegedly patronizing behaviour evoked a response by Wine supporters who later began tagging posts with #wearenotyourgrandchildren, which eventually led to President Museveni dropping the terms in later speeches. The reliance on coercion was further illustrated in harsh missives to the public following the 2016 general elections, with NRM general secretary Justine Lumumba telling crowds in Kampala and Wakiso that any youths protesting the election results would be summarily shot, and more vaguely that the government would deal with disruptors of the peace. These repeated threats are likely to have galvanized the youth, who continue to protest sporadically despite police crackdowns on dissent. The government’s use of patronage systems, allowing the NRM to pour money into constituencies and thereby allow local candidates to barter the largesse for votes, has in recent times become more difficult. The value of cash handouts has allegedly increased with each lost election, putting more strain on a declining economy. Economic growth contracted to 4.6 percent in 2017 after an average of 6 to 10 percent between 2000-2011, which can be partially attributed to external factors, including declining global demand for Ugandan commodities, but can also be attributed to a succession of government corruption scandals that have caused donor funds to dry up. The government’s solution to the economic crisis, namely oil production, a potentially lucrative source of revenue, remains several years away from becoming fully operational. The waning effectiveness of the patronage system was witnessed in the Arua by-election, when the government allied with philanthropist Bryan White to hand out donations and gifts to the local populace, but resulted in independent candidate and Bobi Wine supporter Kasiano Wadri winning the seat against the NRM candidate. FORECAST: President Museveni is now faced with an increasingly agitated and emboldened youth voter base, the erosion of the NRM’s political model, and the growing prominence of social media, despite government attempts to stifle communication such as the social media tax, introduced in July. In the short term, Kampala’s treatment of Wine is likely to increase his popularity among the youth in Uganda. Furthermore, given Wine’s global impact following his visit to the US and expression of support from Western celebrities, the government will likely have to tread cautiously when it comes to dealing with him and his supporters. This can be seen with his brief re-arrest but subsequent release upon his return to Uganda, as they likely perceive that his continued imprisonment as he awaits trial will be viewed poorly. Moreover, any move perceived as using excessive force to clamp down on dissent is likely to encourage Wine’s supporters to push for Western nations to cut crucial economic aid to the Ugandan government. FORECAST: In the longer term, the government and President Museveni will be faced with increasing pressure from the younger generations as a whole, even as Bobi Wine’s own leadership can be viewed with skepticism. There remains considerable doubt over Wine’s political moorings and ideological vision. Indeed, Wine has not yet published any material on the ideological stance that the “People Power” movement would aim to adopt, instead solely focusing on the removal of President Museveni from power, thereby allowing for what calls a “free” Uganda. Moving forward, while this distinct lack of ideological clarity of political identity may appeal to disillusioned youth who largely perceive the ruling NRM as beholden to President Museveni and the main opposition FDC as weak, Wine’s status as an independent candidate will continue to raise questions over his ability to fully form alliances, raise funds for political campaigns, and generally convince political and security elites of his governance potential. Travel to Kampala may continue while adhering to general executive protection protocols with regards to the threat from criminal elements. Those operating or residing in Uganda are advised to avoid the immediate vicinity of any political gatherings or demonstrations, regardless of goal or affiliation, given the risk of security crackdowns.